Can virtual cities help us design smarter cities? A team at McMaster University thinks so. Professor David Harris Smith and SOSCIP Post-Doctoral Fellow Hosein Taghinesuad are using artificial intelligence to build a 3-D model, or virtual city environment, of the City of Hamilton, ON. The research will provide urban planners, engineers and municipalities with a 3-D visual representation of all the components of a typical city, including people, buildings, streets, trees and parks. “The goal is to build a smart city platform that enables individuals to change elements of the model to assist planning activities. Within the virtual city they can conduct simulations for increasing population density, estimate information such as air pollution counts and traffic,” said Prof. Smith, who has been working with virtual world applications with McMaster since 2011. The project is an extension of a SSHRC-funded Partnership Development Grant formed with the City of Hamilton to utilize virtual city environments for public planning. Prof. Smith is also a Director of Research for the partnership, known as *macGRID Simulation Research Network. The team is using a combination of light detection and ranging data (or LIDAR) provided from their industry partner GeoDigital, Geographical Information Systems (GIS) and Google street-view image data sets to build a prototype of the city of Hamilton. With the help of SOSCIP’s Cloud Analytics Platform, they’re integrating and unifying all the data into one system and will use machine learning to populate the virtual city with trees, buildings and other city components. “The first iteration of modelling these virtual cities was very labor intensive, but collaborating with SOSCIP enables us to attempt to develop an automated modelling process,” explains Prof. Smith. The team uses machine learning and image processing algorithms to help the computers identify the city’s components. It’s a significant computational task considering that 65,000 high resolution images were collected to provide data and textural information on Hamilton’s 196,851 buildings and even more for Hamilton’s 198,184 trees. The 3-D model of Hamilton included a total of 58,102 tiles. 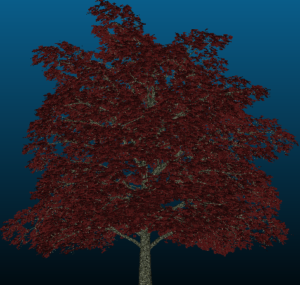 “The average 3-D model size for a tree is around 150mb in Unity. In addition, we need to save the data sets that correspond to each tree in the model so that if a user clicks on that tree, they’d see details related to the species, scientific name, diameter and more,” explained Taghinesuad, a Mathematics & Statistics PhD graduate from McMaster. In addition to providing enhanced visualization for planning activities, virtual city environments can also integrate different types of real-time data that have the potential to improve and enhance how people interact with their environment. “Cities and other metropolitan areas have emerging properties that have discrete actions that are taking place by people, machines, and computational systems. Anything that moves and interacts within a city environment is contributing to the overall emerging quality in a way that cannot be predicted, visualized or apprehended based on the individual characters themselves. “We think it’s important to have the ability and opportunity to synchronize and integrate information that support understanding the emerging properties of a city.